We’re going to go ahead and make fun of John Harkes. The US Soccer color commentator had this to say of Jurgen Klinsmann’s formation change to a 4-3-1-2, “It’s now almost impossible to play with one striker at the international level.” Apparently, Harkes didn’t pay attention when he was an announcer at the 2010 World Cup. Champions Spain played with one striker. Runners-up the Netherlands played with one striker. Third place Germany played with one striker. And fourth place Uruguay basically played with one striker since forward Diego Forlan spent a lot of his time in midfield. The importance placed on maintaining possession – as much a defensive tactic as an offensive one – is but one of the many reasons for the proliferation of one-striker formations, especially the 4-2-3-1 (we’ve covered this ad nauseum on FFG). 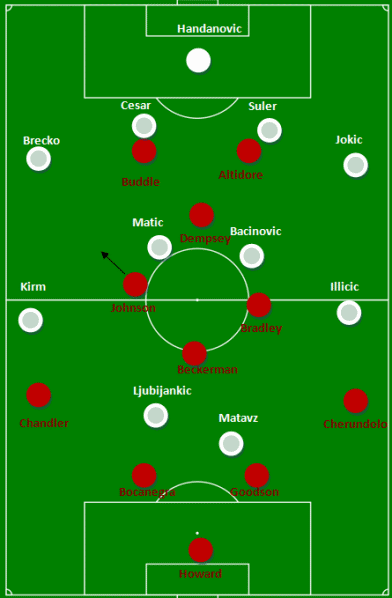 USA's 4-3-1-2 gave the Americans an advantage in central areas against the home side's 4-4-1-1, and Slovenia struggled to deal with the movement of Fabian Johnson. The point we believe Harkes was trying to make was that lone strikers are sometimes stranded when a squad lacks a high percentage of possession. This was certainly true of Friday’s France match. And with Klinsmann playing on the counter against the French, a 4-4-2 might have been called for. But to simply assume one-striker systems are a poor fit for international soccer is, well, astoundingly ignorant. Hopefully this wasn’t Jurgen Klinsmann’s rationale for switching to a 4-3-1-2. Regardless of his reasoning, the switch did pay immediate dividends, though the formation also showed why it’s not a long-term solution. Edson Buddle’s early goal was created by some intense pressing from the front three. Jozy Altidore pressured keeper Samir Handanovic into an ill-advised pass, Clint Dempsey bothered Darijan Matic enough that he coughed up the ball, and Edson Buddle was in a position to take advantage with his once-a-year golaso. 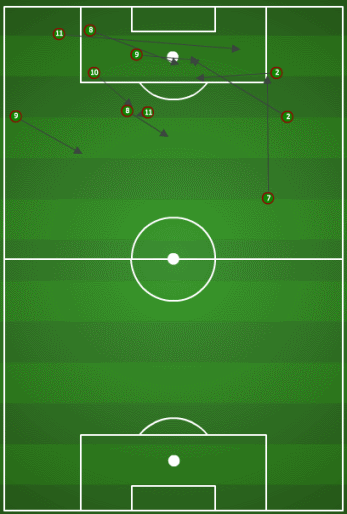 The extra player in the middle of the pitch allowed the US to create goal scoring opportunities from central areas, many of them generated by the space opened by Fabian Johnson. 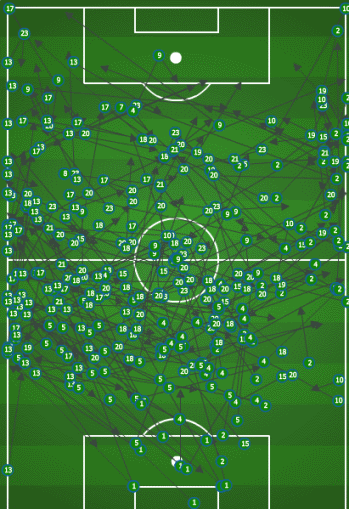 Slovenia also wasn’t quite sure how to account for Fabian Johnson, who flitted between central and wide areas. He was either tightly marked – allowing Timmy Chandler ample breathing room on the flank and Clint Dempsey freedom in the middle – or left alone, giving Johnson space to run into. When Johnson was left alone in the 42nd, he drew the penalty that Jozy Altidore converted for a 3-1 lead. Buddle had previously drawn a foul that, after a free kick and a corner, led to Clint Dempsey heading in USA’s second. But because Buddle won the free kick off a punt from Tim Howard, the second goal had nothing to do with open play tactics. Slovenia’s second goal, however, pointed out the flaw with a 4-3-1-2. While their first was the result of Buddle cheaply gave the ball away (forcing Bocanegra and Goodson into a necessary but too-slow-to-develop shift), the second tally followed an extended sequence of corners and goal mouth threat that the Americans could do nothing to prevent. Notice how USA's lopsided formation let Slovenia play passes from the flanks into central areas just in front of the box. Stationing five players in the middle of the pitch gave the US fullbacks room to go forward, but it often meant Chandler and Steve Cherundolo were all alone in defense. As the match progressed, Slovenia began to push to the flanks more often. Michael Bradley then cheated wide when Slovenia was in possession. This had the knock-on effect of isolating holding midfielder Kyle Beckerman. Slovenia took advantage by pushing wide and then swinging passes toward a besieged Beckerman. The US seemed helpless to stop the tactic until Klinsmann brought on Maurice Edu for Buddle and switched to a 4-4-1-1 (77th). Against top-class opposition, there’s no way the Americans would have gotten away with playing such a lopsided formation. Klinsmann has a bit of a reprieve to continue with his tinkering since the USA doesn’t have another friendly until January. We hope he ignores John Harkes’ advice and finds a way to make a one-striker system work. Gringos, did you notice Harkes’ astounding gaffe? Or were you too busy hoping the Americans would finally win a game to notice? Excellent analysis of the positives and negatives of this formation. I loved that extra man in the midfield and Johnson impressed, but can you imagine those exposed flanks against say, a Germany?! They’d eat us alive. Would love to see Johnson AND Shea out there but that, of course, would mean pulling one of our strikers and defying Harkes’ mandate. Also a thought…where would Donovan fit in this formation? If Klinsmann’s gonna stick with it, it’d be fascinating to see Donovan replace Buddle. Let Altidore drag out a center back and watch Donovan run the channels with just one defender in the middle. For years I’ve been making that argument every time I hear someone say we need to add another striker to the mix and play a more offensive minded game, The sad fact is, we still don’t have the talent base/personnel to be anything but a defense first team, which ultimately means a lone striker. Thanks for the thoughts, Sosumi! Adding a striker certainly doesn’t make a formation more attack-minded by default. You can, though, play a defense-first 4-4-2. That’s how Switzerland and the US both beat Spain. There are always trade offs. And I am not arguing that we would have fared any better against the France’s or the Germany’s of the world whether we lose 1-0 playing one striker, or 3-2 playing two. But I would sumbit that beating the France’s and Germany’s may have more to do with overall talent than formation. However, does playing 2 dedicated strikers give us a better chance against the Slovenia’s, or more importantly the Costa Rica’s (and the rest of CONCACAF)? I would argue that it does. First, we have to accept that our players simply don’t possess the skill level necessary to play consistent, fast one-touch triangular passing tactics out of the back. More importantly, our defenders and holding mids definitely do not possess these skills, nor will we have that type of player in abundance anytime soon. So when we withdraw a striker for a holding mid, we effectively constrain ourselves to playing in our own half, losing more balls in our own half, and having less options up field when defenders do get a clearance – all of this producing too much defensive activity and an attack that is anemic at best (see France, Ecuador, Belgium). Essentially, our nine mids and defenders our tripping over themselves to play a style they are not equipped for and leaving that lone striker as an innocent bystander. Altidore himself is too young and not accomplished enough to play as a lone striker. Why deploy a formation that essentially takes him out of game? 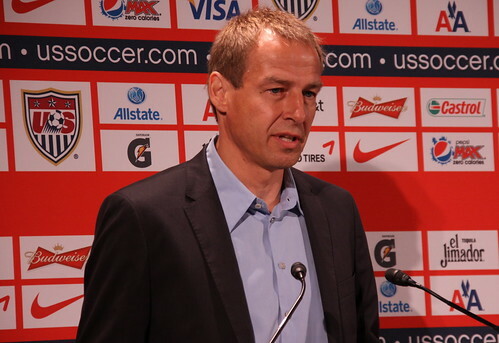 Does Klinsmann think the US will get tons better playing a man down from the get go? One of the benefits of having two dedicated strikers, and an attacking center mid like Dempsey (who is practically a third forward half the time) is that it can force the opposition to honor their presence and keep defenders positioned further back if the threat seems real enough. This effectively stretches the field and opens up space – and this is the key. It means that our guys don’t have to be as tactically accurate with their passes. It provides that slight extra margin of space to compensate for our lack of skill and touch. Is this optimal from a development standpoint – no. But let’s face it, our players are what they are. And it is up to Klinsmann to put them in the best possible formations to take advantage of what we can do. But hey, we were practically playing a 4-3-3 (yea, Barca baby!). Yes, our interpretation means that our passing is more direct/ugly than short/pretty and we don’t always play out of the back as opposed to bludgeon out of the back, but notice how comfortable Dempsey looked playing underneath two forwards much like he does at Fulham. Unfortunately, ceding width in our shape left us wide open to counters down the flank. And this played into our major weakness – the outside backs. Unfortunately, Chandler is young, learning and playing out of position while Cherundolo has definitely lost a step since the World Cup and is getting beat with more regularity. Making matters worse for yesterday’s match was that Boca, Beckerman and Goodson couldn’t seem to get on the same page, and I don’t think that had much to do with two strikers or one. But, a good keeper like Howard can tilt some of those odds back in your favor. So in the end if I’m Klinsmann I consider exploring this formation a few more times, especially if Dempsey and Bradley are available, and without Beckerman (not sure why JK goes with him when Jones and Edu were there). James, I always love reading your thoughts. Thanks! We obviously can’t play tiki-taka like Spain and Barcelona, but against lesser opponents we can certainly play a possession-minded game. Of course, without Donovan, Holden, Torres, Feilhaber, Kljestan, and even Adu, that becomes much harder. Which, like you pointed out, is why it’s so odd that Klinsmann is trying to play a passing style with all of these holding mids. I think Altidore is going to be the best American forward ever by the time his career winds down. But he obviously isn’t Van Persie, so I’d love to see someone else get a run-out as the lone striker. For quite some time I’ve been pining to see Dempsey up top with Holden or Adu underneath. Bob Bradley did this in the Gold Cup final with Donovan instead of Dempsey, and for part of the match it worked (it wasn’t fully successful in my mind because he didn’t press enough). But I’d love to see a front four of Shea/Bedoya, Dempsey, Adu/Holden/Kljestan, and Donovan. Put some combination of those four in front of Bradley/Torres and Jones/Edu (or against lesser competition Bradley and Torres) and you’d have quite the attack. Especially if it’s accompanied with the pressing game Klinsmann has hinted he wants to employ. As the year wraps up we’ll put together a ‘year in review’ series of posts, and this attacking line up will certainly merit an article of its own. Very well put James–in the short term we should be concerned with the “Slovenias” of the world. We’ve got to qualify! From there I suppose Jurgen can start worrying about the European and South American big boys at the WC. Practically speaking, if this formation is producing wins, it’s definitely worth exploring further.